In the period since our inception we have donated in excess of €2m euros to the Holy Land, funding schools, the seminary, humanitarian activities, and of course financing the education of a Maroniate seminarian in Rome. In considering what would be the most appropriate way to commemorate the 25th anniversary of the establishment of the Lieutenancy, providence in the person of Chev Frank Hearns came up with the solution, children, the future of the Holy Land! A number of members of the Lieutenancy have already come up with two thirds of the requirement. 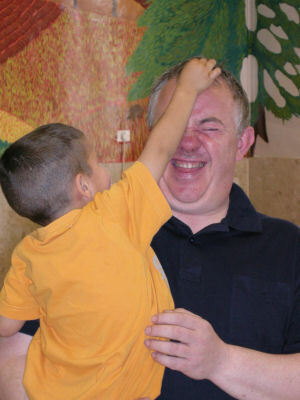 22 May 2009: Prior to the recent pilgrimage to the Middle East by Pope Benedict XVI, Catholic Register editor Jim O’Leary travelled to the Holy Land and encountered many people who were hopeful that the Pope’s visit would be a prelude to peace. 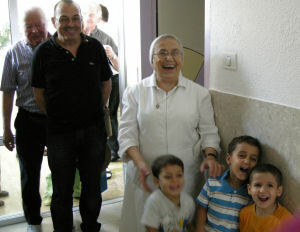 One such person was a remarkable nun whose Bethlehem orphanage has been caught in the middle of the ongoing conflict. Sr. Sophie Boueri is small, frail and, more than simply tired from a difficult day, her face mirrors lifetime fatigue. She is 74. Those who have known her for many years are concerned. She looks so tired, they say. Much more so than even months ago. They worry about how much longer she can go on. She is the face of Bethlehem. It is a typical day. The nursery is full of babies, and toddlers are scampering about the foyer. Visitors are encouraged to hug a baby. Sr. Sophie can feed and clothe them, give them shelter, but the babies need more affection than she and her small staff are able to provide. Sr. Sophie, whose Daughters of Charity order founded a Bethlehem hospital in 1884, has been taking in pregnant unwed women and abandoned babies for 18 years. She explains that an Arab unmarried women who becomes pregnant is typically expelled by her family or often murdered. Their babies are killed or abandoned, and she cites cases of police delivering babies to her that were found in alleys. Sr. Sophie secretly shelters these women, who are instructed to tell their families that they have found a job. To lend credence to the deception, Sr. Sophie gives the women money to send to their families. At 34 weeks, the baby is delivered by Caesarian section and entrusted to the care of Sr. Sophie. She is currently caring for 54 children under the age of six. There is room for more but Bethlehem has become virtually closed to the outside world by the towering concrete barrier constructed since 2002 by Israel in response to the last Intifada. Sr. Sophie’s compassionate hand used to extend to women from Gaza and Hebron but, today, those women are denied entry to Bethlehem without somehow first navigating a bureaucratic maze to obtain entry and exit papers from Israel. Sr. Sophie’s heart aches when she thinks about the fate of those women and their babies. Occasionally she will receive a call to come to the rescue of an abandoned newborn. Before The Wall, she could hop in her car and retrieve the child in an hour or two. Now, however, because of security checks and searches, the same trip takes more than six hours. “I could take in more children but it is so difficult to get through The Wall,” she said. The Wall is a dehumanizing barrier, 10-metres high, made of grey concrete slabs pressed together to form a cement vault that entraps Bethlehem. Entry and exit is through a single checkpoint. There is no passage for anyone without credentials and credentials are unavailable to most residents of the West Bank. Even with proper papers, there are searches and long delays. Israel constructed the barrier to choke off terrorist attacks and suicide bombers. During the Intifada that began in September 2000, Bethlehem was a hotbed of violence and, in 2002, Israeli forces rolled into the city to rout militants who sought refuge in the Church of the Nativity. The symbolism of operating a shelter in Bethlehem for pregnant women and their babies who have nowhere else to turn is not lost on Sr. Sophie. A leaflet describing the shelter’s mission points out that, before the manger birth, Mary and Joseph were turned away at every door. Two-thousand years later, Sr. Sophie’s door is never closed. For now, the children remain in the care of Sr. Sophie. But for every child she shelters, there are untold more who face hunger and abandonment in Bethlehem and throughout the West Bank. That is unlikely to change while Middle East peace remains elusive and the wall is intact. Still, Sr. Sophie believes peace will come. The hollow silence of the orphanage’s hallway was broken with the sound of children’s laughter and the voices of their caregivers. I strained to listen if I could understand what was being said when I realized it was in Arabic. Some of their nurses wore the veil common to the Muslim women that we have seen in the streets. Some wore the Christian cross on a chain around their necks. Bethlehem had once been a Christian enclave; however, due to political upheavals and unspoken persecution, many have sought refuge beyond the borders of both Israel and Palestine. There were at least 50 children of varying ages, mostly with large dark eyes, curly hair and rosy lips that break to a wide grin. Some sprinted around making obvious squeals of joy. Others stared out blankly as their limp and emaciated bodies were placed on a quilt on the floor. Speaking was a small lady with a kindly face - a Catholic nun. “Soeur Sophie Boueri?” I asked. “Oui, e vous êtes?” (“Yes, and you are?”) she asked in return. “I am Ricky Ordoñez, the seminarian from America. I sent you an email about having a Christmas party here with the seminarians and the children.” “Ah, mais oui!” she exclaimed and broke into the warmest, widest smile. It was December of 2006 and I was on my third year of Theology at Mundelein Seminary. My class had just arrived in the Holy Land for a 10-week pilgrimage and study program. Two months prior, we had been tasked to organize a Christmas party with the children of the Creche Orphanage in Bethlehem, raised almost $2,000 in donations and collected about a dozen boxes of toys. The Creche Orphanage is on a slope behind the the Holy Family hospital in a part of Bethlehem that tourists never get to see. Run by the French Daughters of Charity, the neat and clean building is under the protection of the Knights of the Order of Malta. But these were difficult times and Sister Sophie would go to Jerusalem for donations from benefactors when food supplies ran low. More than two years had passed and I had been ordained to the priesthood and assigned to my first parish when I received an invitation to be the spiritual director of a pilgrim group to the Holy Land. I remembered the children of the Creche Orphanage and wondered how they were. At Mass, I shared my memories saying that perhaps the Lord was again “knocking at the door of our hearts to do something”. By the time I reached the sacristy, I had $240 in an envelope marked “For the Children in Bethlehem”. That night, I was at a Chinese restaurant with friends when I shared that I wanted to raise at least $500. When the fortune cookie came, it said “You will receive your heart’s desire!” I laughed and told them that I should have asked God for more. “Amazing” is too simple a word at the generosity of God’s faithful people. In the weeks that followed, money came from anonymous donors and others specifying that they do not want to be publicly acknowledged. School kids gave their allowances and others in memory of deceased relatives. By the day of my departure, the donations totaled $4,717. On Sept. 23, our pilgrim group arrived in Bethlehem and as we made our way to the orphanage chapel, more donations were stuffed into the envelope. For sure, it had now gone well over $5,000. 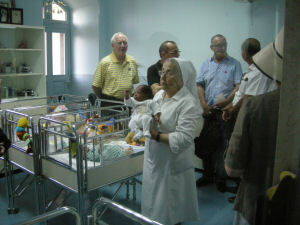 Our pilgrims played with the children in the same hallway where I had first met Sister Sophie. She told us about the difficulties that she encounters, yet she never showed a trace of resentment or bitterness. Her focus was purely to shower God’s love upon the children that have been abandoned on their doorstep, in the garbage heap or given up by unwed mothers. Her mission is to rebuild lives and care for the children traumatized by violence, neglect and rejection. As we left the “little town of Bethlehem” there was an eerie silence on the bus with each pilgrim wondering about the fate of the children of the Creche – all victims of circumstances way beyond their control. Father Ricky V. Ordoñez was ordained to the priesthood in May 2008 for the Diocese of Tucson. He is currently the Parochial Vicar of Sts. Peter and Paul Parish in Tucson. 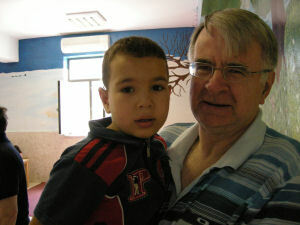 He wishes to extend his gratitude to those who heard God’s call to help The Creche Orphanage in Bethlehem. Bank details of the Creche are available upon request to those who wish to send their donations directly. Please call Father Ricky at 520-325-6015 ext. 8 during office hours. A visit that claimed a lasting place in my heart was to Sister Sophie's orphanage. Here up to 80 children ranging from newborn babies to six year-olds are given tender loving care and learning by Sophie and her dedicated team, who do their best in the difficult and restrictive circumstances of the unsympathetic military occupation. The youngsters are from broken homes or have been abandoned, or handed in by parents who are simply too poor to feed them. Skill, patience and love turn them into responsive, fun-loving adorable kids. Published Tuesday 25/11/2008 15:13 Bethlehem - Ma'an - Employees at the US Consulate in Jerusalem and their spouses made a donation to the Holy Family Orphanage in Bethlehem on Tuesday. The donation was comprised of 270 cans of milk and 15,000 Israeli Shekels worth of food for the 116 children at the orphanage. It was made in honor of the upcoming US Thanksgiving holiday. Caroline Nolan, who supervised the collection of the gifts, said the staff and their families have been gathering money for two weeks to have enough for more than 120 children. She explained that the donated milk and food will be sufficient for the months of December and January. The delegation also toured the orphanage and was informed by education supervisor Jeries Allawi about the services offered to the orphans. Allawi explained that the children range between 3 months and 5 years. Sixty-eight of them are in the external nursery and 48 are abandoned children. Sister Sufi, who is in charge of the orphanage, thanked the consulate staff and their families for the efforts they made in collecting donations which she said will undoubtedly help the orphans.